eD@HoMe: My 2 covers from England! Hi, sorry for not updating the blog for the past few days. I was away for my annual In camp training (Army reservist). In Singapore, it is compulsory for all male Singaporean citizens upon reaching the age of 18 to serve 2 years (used to be 2.5 years during my time) of full time National service in the Singapore Armed Forces (SAF), Singapore Police Force (SPF), or the Singapore Civil Defence Force (SCDF). After completion of his full time service, he is considered to be "operationally ready", and is thereafter known as an Operationally-Ready National Serviceman (NSman - Reservist). He is then liable to go through either a high key In camp training (seven days or longer) or a low key training (six days or less) on an annual basis, until he reaches the age of 40 or 50 depending on his rank. 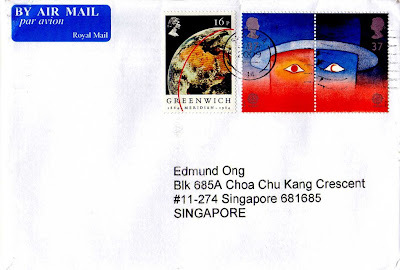 Back to philately, for today, I would like to share with you 2 covers sent by an eBayer from Torquay, England. 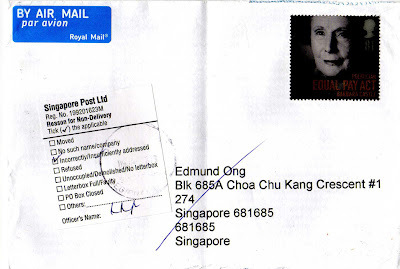 The first cover was sent to Singapore late last year but was returned to the sender in England as it was incorrectly addressed. The sender was very kind to give this cover to me by sending it together with my eBay purchases in the second cover (of cos this time with the corrected address). It's a pity that the stamp was not postmarked. The stamp on the cover depicts famous politician, Barbara castle. It belongs to the "Women of Achievement" series, issued on 14th October 2008. 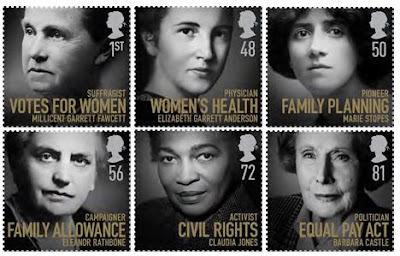 The stamps in this set, depict Millicent Garrett Fawcett (1st), Elizabeth Garrett Anderson (48p), Marie Stopes (50p), Eleanor Rathbone (56p), Claudia Jones (72p), and Barbara Castle (81p). 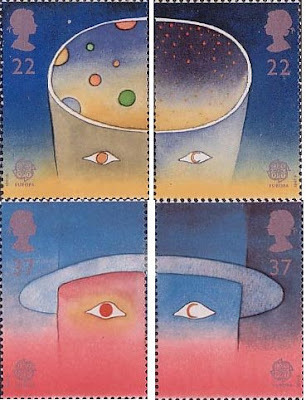 The stamps franked on the second cover belong to the "Centenary of Greenwich Meridian" series, issued on 26th June 1984 and Europa stamps, "Europe in Space" series, issued on 23th April 1991 respectively. 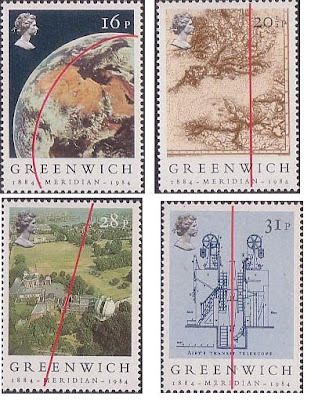 View of Earth from Apollo 11 (16p), Navigational Chart of English Channel (20½p),Greenwich Observatory (28p), & Sir George Airey's Transit Telescope (31p).